The snow is starting to dust the ground, holiday cheer is in the air, and you can smell chimney smoke from a mile away. Winter season is upon us, which means that if you're looking for a few ideas for kid's winter parties, then you've come to the right place. Many people think that if you're throwing a party for your child during the winter season, then it has to be holiday-centric. Such is not the case. If you want more winter-themed ideas, or winter-inspired invitations then look no further. You can incorporate all the fun and fresh wintertide themes that are what make this season most distinguished. For some kids, their birthday party falls around the holidays which means holiday birthday party invitations are where it's at. Our collection of holiday-themed invites is a huge hit each and every year. The holiday season is a joyous occasion for many, and throwing a party around this idea can create lasting memories for your child to hold onto throughout the months to follow. With our stylish Santa invites, or our Gingerbread house invitations, there is always a holiday theme just waiting to be explored. There are so many different yuletide celebratory ideas worth considering, it may be hard to narrow down to just one. Our exclusively unique assortment of kid's birthday invitations continues to be a fan-favorite for our Polka Dot Design customers. Parents are constantly looking for a new and exciting idea that will make their child's birthday party a memorable, talked-about event. This is why we pride ourselves on having one-of-a-kind invites for any occasion. You won't be able to find many of these styles and designs anywhere else. Browse our collection to get a feel for the type of rare invites and stationery we carry. We also encourage you to leaf through our invites in order to inspire your next kid's winter party idea! Get your creativity flowing through our clever arrangement of invites. We also feature a special bevy of holiday invitations perfect for your upcoming family gathering or corporate Christmas party. The holidays only happen once a year, which makes this time quite special for many. This is why the perfect party invitation needs to be a wonderful memento documenting this fantastic, spirit-filled season. Peruse our holiday invites, which include cookie swaps, cocktail parties, New Year's Parties, and more! A kid's holiday party is the perfect way to celebrate the birthday of your child. We have a slew of winter party ideas to make any child's birthday a winter wonderland. From an ice-skating party to a snowman-themed extravaganza, you can throw a winter-inspired party for your child that doesn't need to be overly Christmasy. The holidays are a great time to focus on the incredible things that make this season special—from cookies, to presents, to snow-filled delights. Celebrate your loved ones with a multitude of much-deserved holiday cheer. 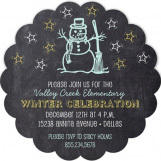 Save up to 20% or free shipping on your kids winter party invitations with a Polka Dot Design promo code. For more information, contact us at service@polkadotdesign.com or call the Polka Dot hotline 1-877-816-0884.